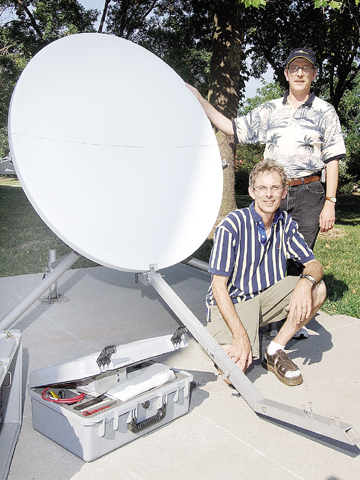 Mark Hendricks, left, of Communications and Information Technology, and Cliff Ritz of Information Services pose with communications equipment. Hendricks and Ritz hauled the equipment in a university van to Gulfport, Miss., earlier this month to set up emergency communications systems after Hurricane Katrina. Photo by Brett Hampton/IANR News Service. Two UNL staffers are back home after helping build an emergency communications network in Hurricane Katrina-ravaged Mississippi. UNL will be putting on sweaters and turning out the lights earlier this winter in response to unprecedented and unbudgeted increases in energy costs. Editor's Note - This is a campus wide E-mail issued by UNL Chancellor Harvey Perlman on Sept. 26. A four-year National Science Foundation grant of $710,970 will enable the creation of interdisciplinary teams of select mathematics and biology students to conduct research into projects of interest to both fields of study. Marshall Olds, professor of French at UNL, will be honored Sept. 29 when he is decorated as a Chevalier in the Ordre des Palmes Academiques by the Republic of France. Through the help of UNL assistant professor Sandra Williams and two undergraduates, 400 sixth- to eighth-grade students have created a new mural for Mickle Middle School in Lincoln. Charlie Nutt, associate director of the National Academic Advising Association, will examine trends in student advising during a three-part program, 10:30 a.m. to noon Sept. 30 in the Nebraska Union. University Theatre, the academic year production program at UNL's Johnny Carson School of Theatre and Film, kicks off the 105th season with "Wonder of the World," a comedy by David Lindsay-Abaire. Performances are at 7:30 p.m. Oct. 6, 7, 12, 13, 14 and 15, and at 2 p.m. Oct. 9 in the Howell Theatre, Temple Building. Diane Cawein Barger's faculty recital is a multi-disciplinary event titled "Shall We Dance?" and will feature both music for clarinet and music relating to dance in some way, along with performances by five UNL dance students. "Shall We Dance" will be performed, at 3 p.m. Oct. 2 in Kimball Recital Hall. Barger is associate professor of clarinet. Modern Arts Midwest, a contemporary art gallery located in the Historic Haymarket District, 800 P St., Suite 300, will present "Alternative Realities" with artists Mo Neal, sculpture, Department of Art and Art History at UNL, Joe Broghammer, David Stewart and Faridun Zoda. UNL's Osher Lifelong Learning Institute will present Ted Kooser 7 p.m. Oct. 3 at Wick Alumni Center. The U.S. Poet Laureate and UNL English professor will talk about his first year as poet laureate, offer to read his works, and sign books. Norman Geske, director emeritus of UNL's Sheldon Memorial Art Gallery and Sculpture Garden, will deliver a four-part lecture series at the Sheldon in October. The "Let's Talk Art" lecture series will be presented at 2 p.m. Oct 2, 9, 16 and 23 at the Sheldon. The American Chamber Players will perform at 7:30 p.m. Oct. 13 at the Lied Center for Performing Arts. The ensemble will be playing selections from Gioacchnio Rossini, Henri Dutilleux, Erno Dohnanyi, Madeleine Dring, and Felix Mendelssohn. Renowned dancer and choreographer José Porcel will perform with his Ballet Flamenco troupe at 7:30 p.m. Oct. 7 at the Lied Center for Performing Arts. In "Après Vous," opening at the Mary Riepma Ross Media Arts Center on Sept. 30, two of France's most celebrated actors, Daniel Auteuil and José Garcia, team up in a romantic comedy from director Pierre Salvadori that ponders if being a good samaratin is actually a bad thing.